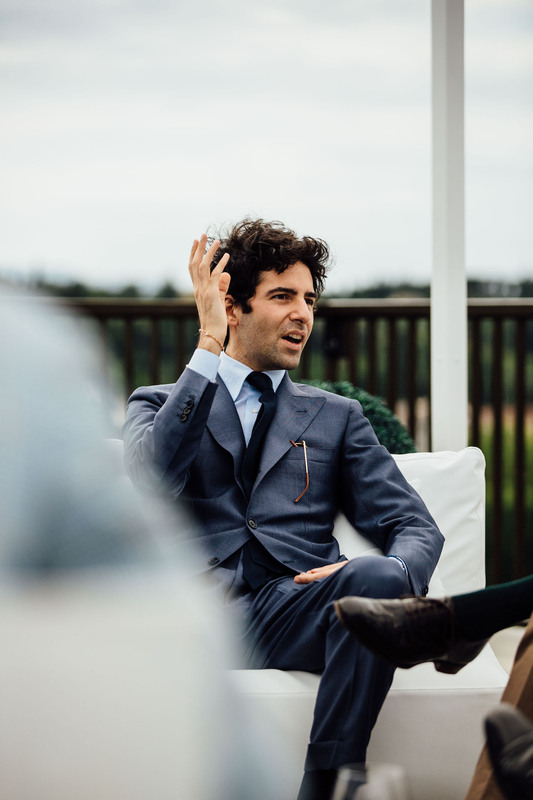 One of the nicest things about the Young Tailors Symposium last week was the fact we managed to arrange a film - something that will record for the hundreds of thousands of you what we discussed and enjoyed. We tried to do something similar back in January, but the crew fell through at the last minute. This time, we had BluPhox films, led by the broadcaster and Hogtown Rake Pedro Mendes. Their four-man team spent Tuesday and Thursday around Florence and Pitti, filming the background to the event. And then the Wednesday afternoon with us - the tailors, hosts and translators. This meant we had to conduct our conversation twice: once for the cameras at Hotel Villa Cora (kindly arranged by Stefano Bemer), and a second time during the Symposium. We chatted, initially, on the rooftop terrace - where these pictures were taken. And then spent a scorching hour in the garden filming the talk. Everyone was wonderfully patient, including Joe Ha and George Wang, who translated for Chad Park of B&Tailor and Arnold Wong of WW Chan respectively. I'll write more about the substance of that talk tomorrow, but here are some initial pictures of our speakers. 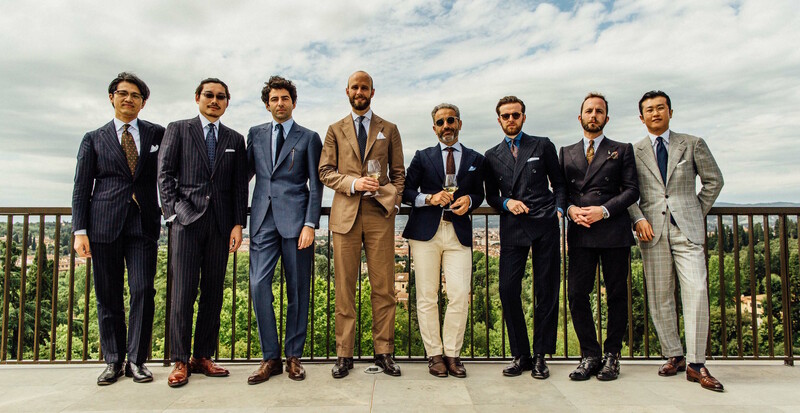 At top, with everyone lined up: (left to right) Satoki Kawai of Sartoria Cresent, Arnold Wong of WW Chan, Gianfrancesco Musella of Musella-Dembech, myself and Tommaso Melani of Stefano Bemer; Eithen Sweet of Thom Sweeney; Davide Taub of Gieves & Hawkes; Chad Park of B&Tailor. You can follow the discussion on The Young Tailors Symposium – filming on the roof by entering your email address in the box below. You will then receive an email every time a new comment is added. These will also contain a link to a page where you can stop the alerts, and remove all of your related data from the site. Looking forward to more coverage of the event. 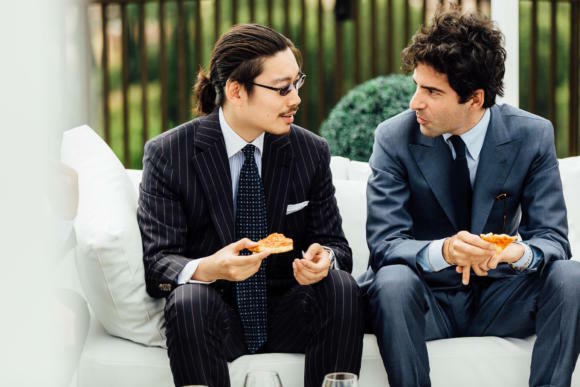 Interesting footwear on Davide Taub it seems from a distance..
What do you think of the shade of blue that Gianfrancesco is wearing, but for a linen suit? Something like WB60139 at W. Bill. 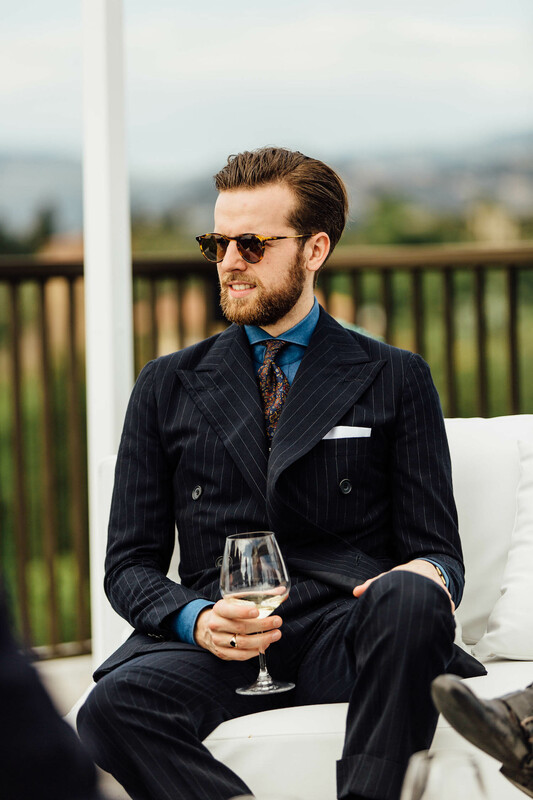 Tobacco seems all the rage now, so this could be a nice alternative without the formality of darker blues. I’d agree with Simon, at least as regards those mid blues with a touch of “electric blue” that one often sees these days. What the hell has David Taube got on his feet?! Triple-buckled black boots. He doesn’t feel the heat. That may be an understatement Simon. Is that a waistcoat underneath David’s double breasted jacket?! Am I right that it is quite unusual to wear both? Definitely (and defiantly) an example of totally individual style (and comfort) to anyone who may think the looks are too contrived. Yes, and yes it is very unusual. More common in days without central heating… and not in Florence! I have to say this is all starting to look a little contrived and if these are the ‘young tailors’ I’m starting to get worried. It’s a little bizarre when guys like Bryan Ferry, Leonard Cohen and Bill Nighy are showing them a clean pair of heels ! 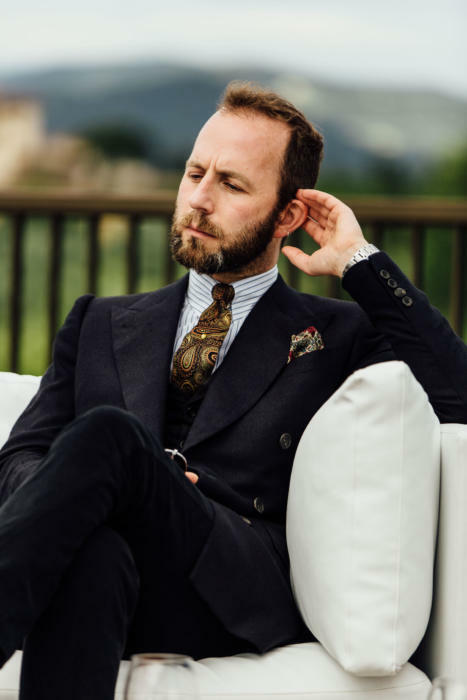 David, I’d like to know what you mean by contrived, given I put a lot of time and effort into gathering this group of my fantastically talented tailors from around the world. I would be careful not to conflate style with skill. A lot of what you see in these photos is fashion, quirks, individual takes on classic. That’s why they all look so very different. I wouldn’t go near the triple lock boots, but the Chad Park rig looks really interesting. Life would get very boring rather quickly if everybody wore pretty much the same thing all the time, as was the case eg after WW2. Of course you did but like poles attract and unlike poles repel and what you do going forward will be completely your business but showing a montage of pucker young men resplendent with pocket hankies ( Mr.Musella excepted) is inevitably going to be a bit one dimensional. What is or could be interesting is individual style. 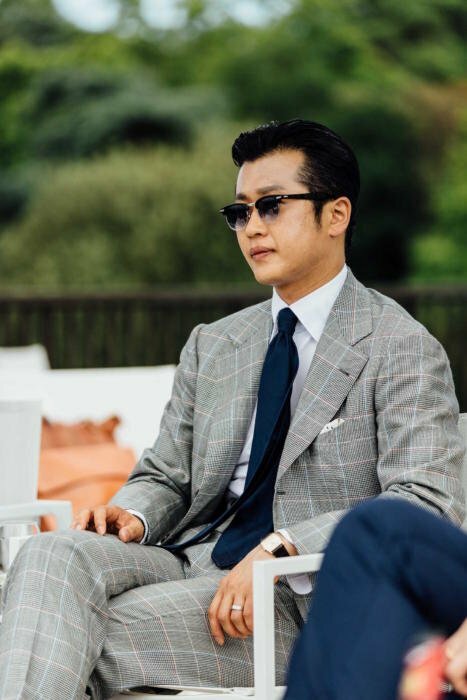 the way people wear their suits. I like this site but self praise is no recommendation and it would be nice to see a closer examination of individual style. That shoulder construction on Davide Taub’s jacket is quite impressive. Interesting that half of the young tailors chose navy blue, striped suits. when is the film coming out? Looking forward to seeing it.